Packaging in Japan is something else. Mini cakes are wrapped in a plastic based foil then placed in a plastic tray inside a box often made of - you guessed it - plastic. And these little cake creations are everywhere. The one shop where we found fresh produce that wasn't wrapped in layers of plastic was a small fruit shop devoted to selling apples in the small ski village of Nozawa Onsen. Other than the famous Tokyo Fish Market and a department store where a rockmelon cost the same as a bottle of Moet, this was the only non-packaged fresh produce we found. 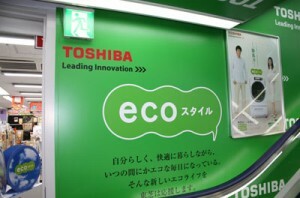 Yodobashi, the mega electrical/camera shop, had one level devoted to advertising eco friendly washing machines was encouraging. Organic products were hard to find but then I'm spoilt for choice in London. We found one café called Thanks Nature and a travelling partner gave me an organic sugar sachet he'd taken from an organic café but that was about the only organic product to be found on the two-week trip. A ride on the monorail gives you a sweeping view of Tokyo and it's apparent no expense or environmental consciousness was spared on building some of the most bold and light intensive architectural structures on the globe. The highs and lows of Japan's eco-friendly efforts do vary somewhat from the EU but on the whole it's easy to see the planet is on the country's agenda. 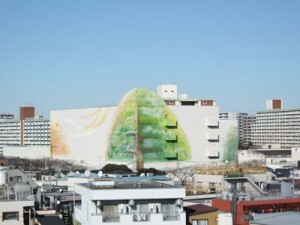 A great little website illustrating Japan's eco credentials is Japan For Sustainability so if you're interested in visiting this beautiful country or want to poach ideas from how they're going green on the other side of the planet check it out.